Road test your vehicle and apply the brakes as normal. Park your vehicle on a solid level surface and set the parking brake. Open the hood and locate the master cylinder reservoir. Clean the outside of the master cylinder in the area of the cap - before removing the cap - to avoid getting dirt/debris into the master cylinder. Evacuate all the brake fluid from the reservoir. 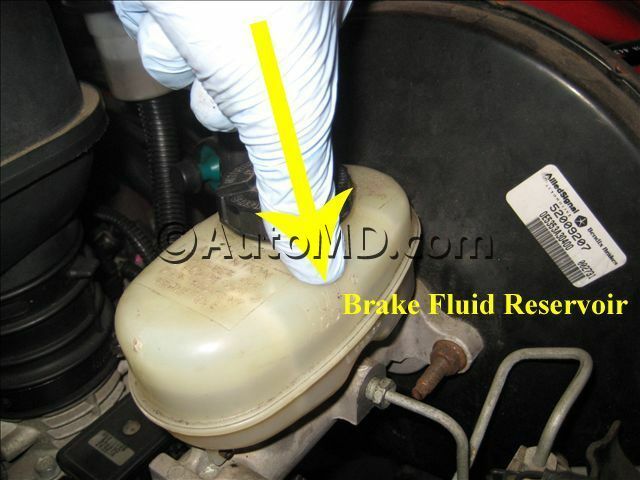 Once all the brake fluid has been removed, fill the reservoir with new brake fluid. 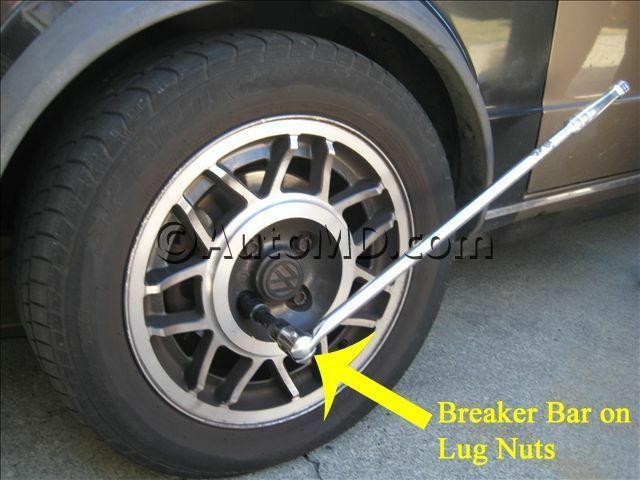 Break loose all the wheel lug nuts but do not remove. Using a floor jack correctly rated for your vehicle's weight, jack up your vehicle until the wheel assembly is off the ground. Refer to your vehicle owner's manual for the proper jacking point. Placing the jack in the incorrect spot can damage your chassis! Secure the vehicle with a properly rated jack stand. Do not rely on the jack to hold the vehicle up while working. Repeat step 6 for the remaining wheels. Verify the vehicle is properly secured before you continue. If you misplace a jack stand, you could damage your chassis or be seriously injured. Remove the wheel lug nuts. Remove the wheels and set them aside. Locate the brake bleeder valve on your passenger side rear brake; the brake caliper or wheel cylinder physically located furthest from the master cylinder. 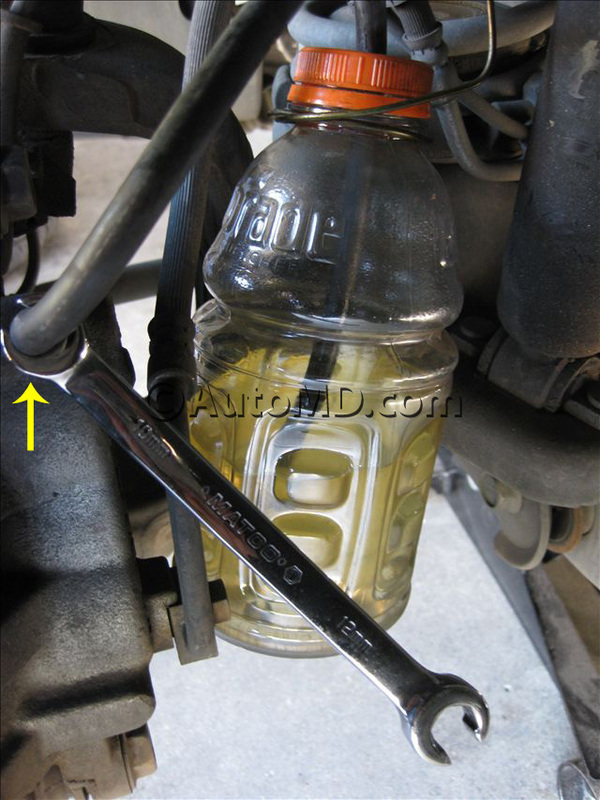 Install a piece of clear plastic tubing over the bleeder valve and place the other end into a clear container (1/4 filled) of new brake fluid. Place a 1 x 4 block of wood under the brake pedal to prevent the pedal from traveling too far. Have your assistant pump the brake pedal several times and then hold it down. Crack the bleeder valve open. Old fluid and air bubbles will travel down the clear tubing and into the container. 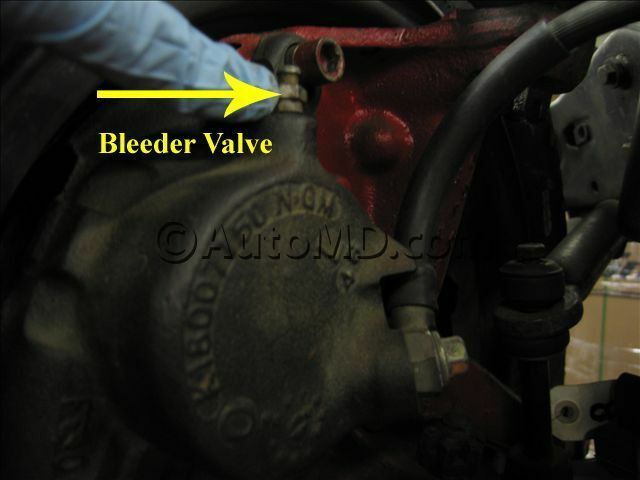 Tighten the bleeder valve with the brake pedal depressed (pressure still applied). Repeat this process until clean fluid comes out of the bleeder valve and there are no more air bubbles. Check and refill the master cylinder with clean brake fluid. 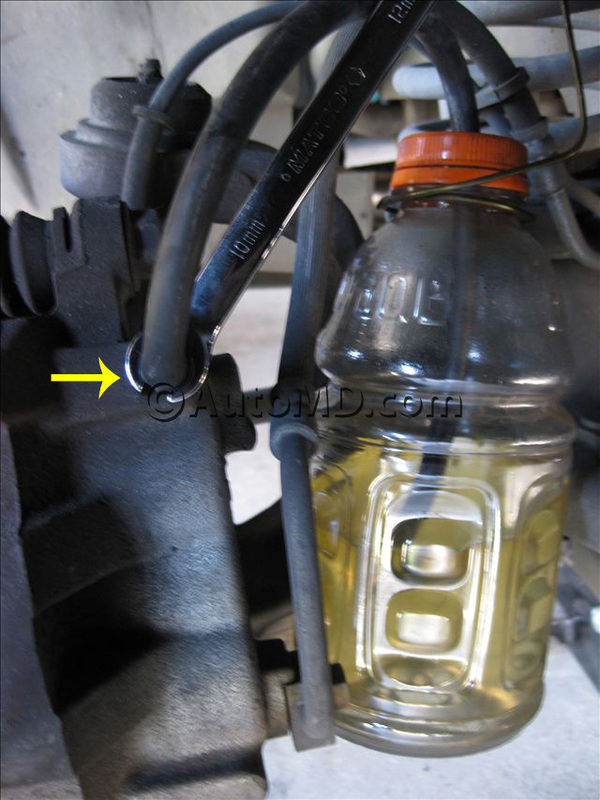 Do not allow the master cylinder to drain completely. Repeat steps 10 through 14 for the left rear wheel, then the right front wheel, and finally the left front wheel. Reinstall the wheels and snug down the lug nuts. Lower the vehicle to the ground and torque the lug nuts to the manufacturer's specifications in a star pattern. Verify that you have a solid brake pedal, and road test the vehicle..